First up is the latest game I have received, La Granja from Spielworxx. This is their latest release and seems to be quite hot, being sold out everywhere. 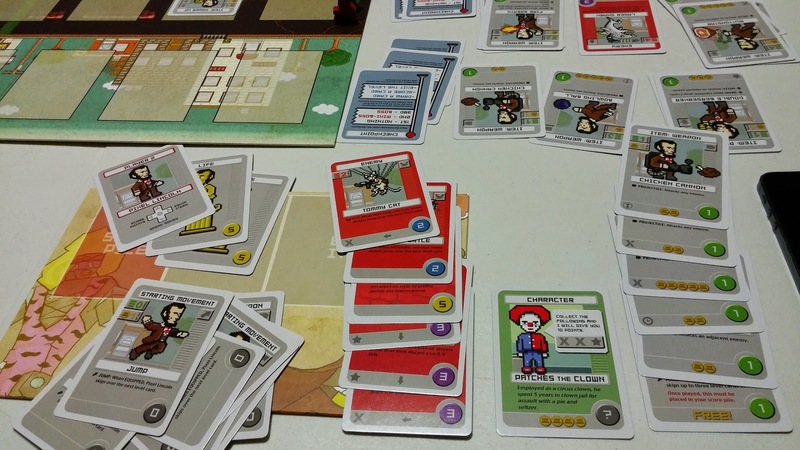 I managed to help my friend get a copy and after a solo play of it, I was confident enough to table it. La Granja plays 1-4 players and essentially feels like a Feld game. There are many ways to score victory points and a mix of different mechanisms thus giving that Feld feel. Wait did we not see this in Luna... ? Even the designer offers his gratitude to the various designers where he got the inspiration for the mechanisms in the game from. The game plays over 6 rounds and in each round there are 4 major phases. 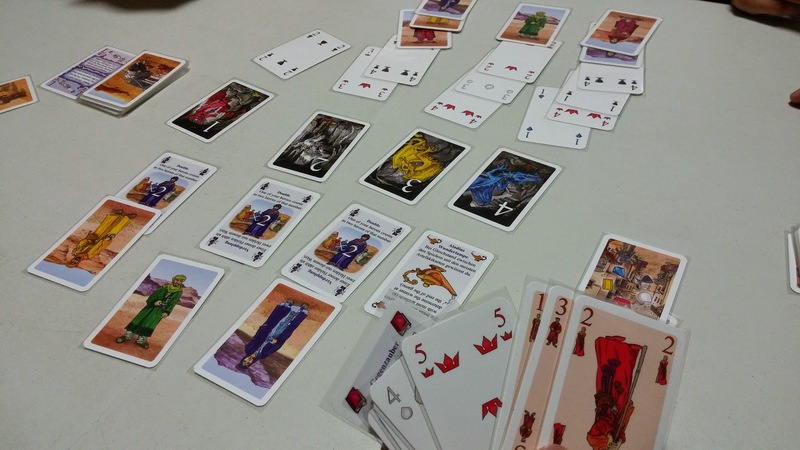 In the first phase, players are playing a card and getting a Roof tile. The cards are multi-use as they can be placed in any one of the 4 available spaces on the board and they will function differently. This is where the Glory To Rome aspect comes in. 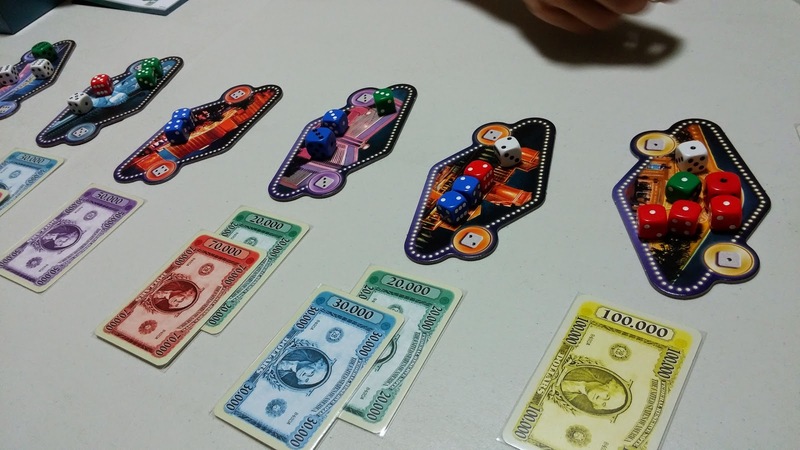 Next, players will get revenue by choosing a die available and getting the resources. Each player will choose 2 dice and the final remaining die, all players will get the benefit. Next, players will get to deliver. They deliver goods either to the main board where if you complete a row, you will get a crafts token which grants you benefits at various phases of a round. They can also deliver goods to the market barrow which are cards placed at the top of your farm. Doing this will give you a trades good and points. It will also allow you to place a token onto the main board where you could kick other players' tokens off and score points. This is the Luna mechanism as well as pick-up-and-deliver to score points. Final phase is your typical clean up. 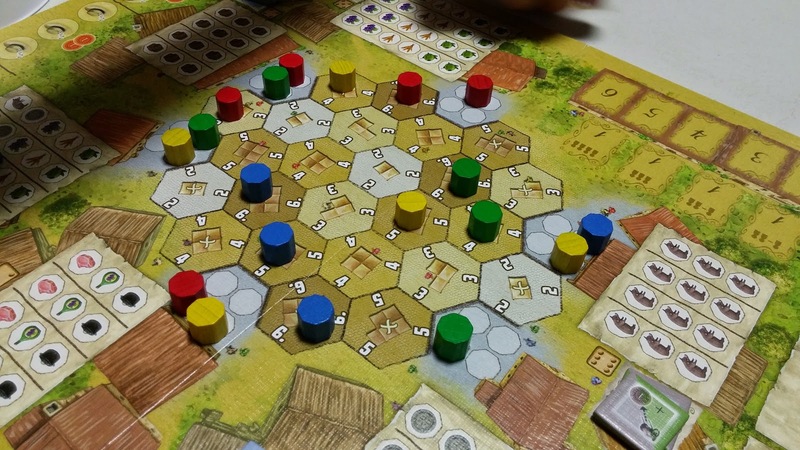 Game ends after 6 rounds and players get to sell all farm goods to get points from the money and whoever has the most points will win the game. So what did I think of the game? As mentioned it feels like a Feld game with the different ways to score victory points and the different mechanisms put together. However it seems to be missing a little of that Feld spark to make it shine. Rule book could use a little bit of improvement because of the way we interpret certain specifics (i.e. using YOU CAN ONLY instead of YOU MAY). Components wise its all very good. Setup can be a little bit fiddly but nothing unmanageable. I definitely recommend going through the game solo so that when you do teach it is easier. While solo is ok, you have more control over it than if you play multiplayer. Solo play is all about efficiency as there is no one to take those bonus points away from you. Playing with other players is definitely where the various mechanisms will shine. For example the revenue phase is much different as players have to see what dice are available and how they can predict what others will want so that he can get what he wants and then some. It does play quickly (perhaps 1 hour or so) so it definitely doesn't overstay its welcome. Final gripe is that there are a LOT Of text on the cards. Perhaps it could have been better with some icons to aid in ease of understanding. Overall, I have only played this solo and a 4 player game. I prefer the 4 player game to solo. The interaction definitely helps the game play and the various mechanisms all make sense. This is a medium weight euro and to me right now it is an average game. Nothing really new and exciting but no glaring issues either. TRY BEFORE BUY! Next up is the card version of Aladdin's Dragon. Now I have played the board game version and I was quite taken to the bits (ooo all those nice plastic bits) as well as the game play. There is a lot of guessing your opponents and interaction. It seems that this card version is suppose to mimic the experience but in a much smaller package, no more bits or bling and play much faster. Essentially the game feels very much the same. The end game objective happens when all treasures have been obtained so the game will typically take about 30-45 minutes. You don't get to hold the nice plastic chits but the cards are more functional and allows the game to occupy a smaller shelf space than before. The level of interaction and sabotage is still very high as players vie for the treasures to win the game. The spells seems somewhat neutered though because we did not attempt to get many spells and even when played did not make too much of a difference. So if you liked the board game version, do check out this card game version as it retains a lot of what I liked about Aladdin's Dragon and plays much faster. If you have never played it, then I suggest to at least give it a try because it is easy to each and learn and provides a lot of entertainment. TRY BEFORE BUY. Next up is CONCEPT. I have heard and read about this game but did not have any desire to get it to try it. I guessed that this is more of an exercise than a real gamer's game. I felt that it will probably be more of like a team-building type of environment. Since someone had a copy, we decided to give it a go. In concept, a player will draw a card that will have 3 sections (Easy, Medium and Hard) with 3 items each. The player will decide on one of the item and then the timing will start. The player has a set amount of time to use the bits provided to indicate on the icons board what the item will be. The other players will then have to guess the item and if someone guesses it, that player and the person who chose the item will gain points. Yup, pretty much what I had thought it is. Its an exercise more than a game. Perhaps because the box and the components lend it an impression that it is supposed to be a real game? But when you get down to playing, it feels very one dimensional. Either that person can guess it or he/she can't. There is also quite a lot of frustration because the way we interpret the item varies a lot from people to people. The examples given in the game manual seems to make a lot of sense but when we are doing it, it doesn't seem as straight forward. 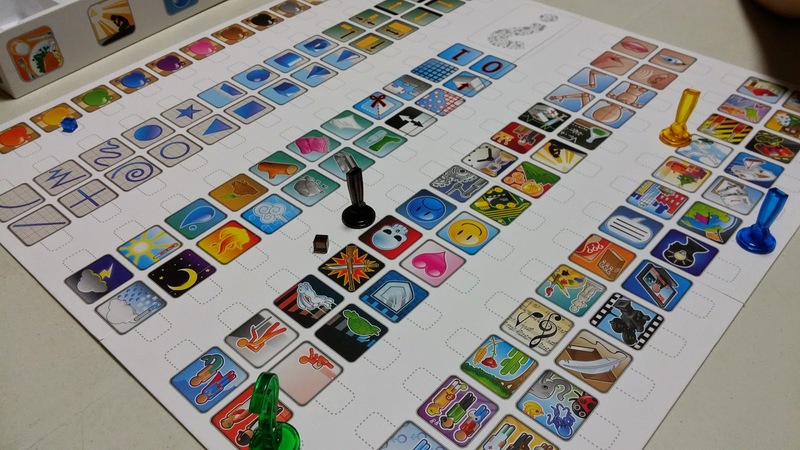 For me though, I am expecting just a little bit more of a game from a Spiel Des Jahres nominee so I am somewhat disappointed when after playing, I have the thought "so that's it? really?". If you are looking for party games or friendly games to introduce non-gamers to, then there are much more better games like No Thanks or Resistance. This is definitely not for me. PASS. One from our group has never played Pixel Lincoln before and was intrigued by the art so we decided to bring this out. I had to refresh my memory again because it has been a really long time since I played this Game Salute release. The game plays pretty much like a 8-bit side scroller. At its core, it is a deck builder but using your deck, you will move your Pixel Lincoln meeple through the levels and defeat enemies and mini bosses until you encounter the final bosses. The game ends when 2 bosses have been defeated, players then count up the points they have accumulated from their deck and whoever has the most points will win. We all just kept making 8-bit noises and humming the Mario tune..
As I had mentioned before from my tweets, this game really needs an 8-bit sound track while playing. Or a sound board! That will be so cool! Whenever players defeat monsters or JUMP or die, then they can click on the sound board to generate the appropriate sound effects. THAT should be how this is played. Though if all players are willing and sporting enough, they can use their mouths to create the sound effect. Not perfect but it does create the mood enough for us to have lots of laughs when playing the game. The game itself is rather simple really. Jump, move, attack enemies and buy items. What adds to the levels are the secret items and special characters. The mini bosses seems a little too easy to defeat and the final bosses, while not exactly an instant push over, should fall over easily by the time you reach them. To fully enjoy the game though, you will need, NEED the expansions which add a LOT of cards to make the variety and things you meet much more exciting. As it is, the base game is simple, sufficient and ultimately way too big a box for what it has. To me it is a light, average rating game and where it shines will be how the players interact with the game by producing all those sound effects. TRY BEFORE BUY. Final game of the night is Las Vegas with the expansions. The base game is a very simple game where you are rolling dice and seeing how much money you can grab by placing your dice to the appropriate spaces. If there are other players' dice at that location, you have to have majority to get the best money card available. Otherwise you may have to get the 2nd best or, worse, get NOTHING at all! If there are ties, then you and the other player knock each other out. The remaining players can then resolve as per normal. The expansions we played added a bigger die which counts as a 2 and purple dice to be used to knock dice (ours or opponents') out so that they can reroll it again. I'll chalk it up to our group because for such a simple and straight forward game, we play it in a very cut throat manner. We block, we kick and we sabotage. Sometimes in a round, maybe only 1 player will be able to grab any money cards because we had blocked each other so well. The key though is to ensure you have enough dice around to make a difference in the later rounds. The luck factor does kick in from time to time but throughout the game, your decisions as to which die/dice to place should outweigh the issue of luck in the game. It is a light, dice rolling fest which can be fun with the right group of people. TRY BEFORE BUY. So that's it for the night and we ended around 3AM. One of our group had to take a 20 minute nap when we were playing Pixel Lincoln as he was dozing off. 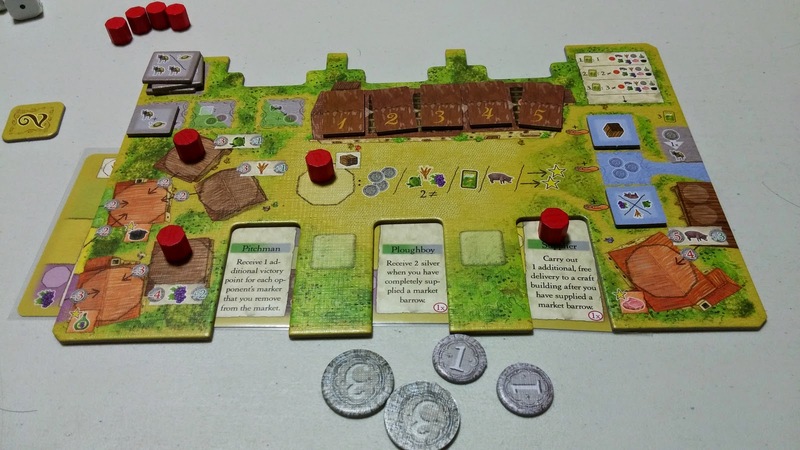 I was really glad to be able to try La Granja before handing the game over to my friend who bought it and determine whether or not if it is my cup of tea. I will like to thank Jason, Quentin, Roy and Charles from this group for all the fun times we have had playing all the new hotness and all the cut throat-ness we have had. Sometimes, even the simplest of games we can make it so devious with all our moves to block each other as well as the bantering. We are talking about attending a convention together next year so here's hoping that plan will happen! Such a wonderful way to sign off our 'last' gaming session with this post! Farewell and we will miss the cutt-throat Red player! We had our first official session last week (w/o you) and looking at the Red pawn reminded us that you are being missed! Yup agree on concept ....... I thought it was too 1-dimentional too.